How Do Potential Clients Find My Company's Clutch Profile? 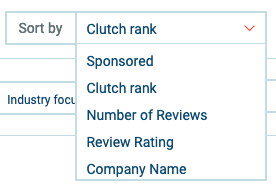 Leads find your company on Clutch by filtering our Reviews Pages to create a shortlist of services providers that meet their needs or searching for industry terms on Google. It's important for your company to submit client references to show up when Reviews Pages are sorted by Clutch Rank, number of reviews, or review rating because we weigh the number, quality, and recency of client reviews the most in our ranking methodology. In organic search, B2B buyers who search “company name + reviews” or “industry + reviews” in Google are more likely to find your business if you have a profile on Clutch.